February 16, 2010  Mexicans have few qualms about buying knockoff products. A recent study says sales of pirated CDs, DVDs and other goods in Mexico — worth $75 billion a year — cut into government tax revenues, discourage foreign investment and fund organized crime. February 10, 2010  The lagging U.S. economy continues to take its toll on Mexican migrant workers, who are sending less money home — 16 percent less in 2009. The decrease in remittances is affecting the economies of many Mexican states, especially rural areas. In Hidalgo, abandoned houses and half-finished projects reflect the downturn. January 29, 2010  NPR's Jason Beaubien has been covering the aftermath of the massive earthquake that decimated Haiti on Jan. 12. He says corpses are so common both on the street and oozing out of the wreckage, that it's the living who haunt him. For the country to be reborn, and to avoid becoming a wasteland kept alive on international aid, he says the living need to heal — and dream of a new future. January 22, 2010  Haiti's government has announced plans to relocate 400,000 people made homeless by the earthquake to tent camps it plans to erect outside the capital, Port-au-Prince. The camps will have facilities such as water and sewage that many Haitians now lack. January 22, 2010  It's been more than a week since the devastating magnitude 7 earthquake flattened large sections of the Haitian capital Port-au-Prince. There have been frequent aftershocks. Assistance is arriving, and the General Hospital is functioning again. Still, hundreds of thousands of people are living on the streets without access to even tents. January 21, 2010  Relief supplies are flowing in to Port-au-Prince to help hundreds of thousands of Haitians left homeless by last week's earthquake. 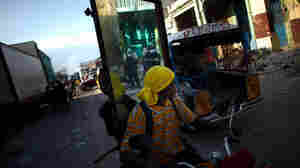 Food deliveries have been sporadic and have only been reaching a small portion of the people in need. The U.S. military is now the largest single-food provider in the devastated Haitian capital. January 20, 2010  After waiting for more than a week for relief deliveries that still haven't reached many in the capital, hundreds of desperate Haitians scoured stores in the main commercial district searching for food and items they could sell. 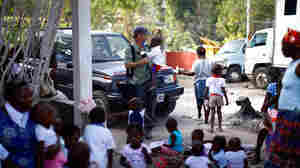 January 20, 2010  Even before last week's deadly earthquake, Haiti was overrun by orphans. Now tens of thousands of children have been orphaned in the disaster. January 20, 2010  More than a week after the earthquake, hundreds of thousands of people remain without food, clean water or shelter in Port-au-Prince. As the U.S. military and international aid groups try to get relief supplies into the embattled Haitian capital, many residents are attempting to flee the city. People are looking for rides to other parts of the country. January 19, 2010  U.S. forces spread out in the earthquake-ravaged Haitian capital Tuesday as part of a massive humanitarian relief effort. Soldiers from the 82nd Airborne took control of the crumpled national palace one week after the deadly quake. January 19, 2010  Thousands of people still need medical help or simply food and water after last week's earthquake. People who were severely injured and in the hospital before the quake relied on others to help them. In most cases, they need even more help now, but that assistance isn't coming like it did before the disaster struck. January 18, 2010  U.S. Marines are arriving in Haiti today to bolster American troop presence there. NPR's Jason Beaubien describes the chaos in the streets of the capital and talks to the U.S. military and ambassador about the delayed arrival. 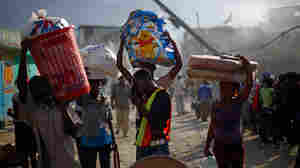 January 17, 2010  More relief supplies are arriving in Haiti on Sunday as part of the international response to last Tuesday's devastating earthquake in the Caribbean nation. While relief is getting into the country, it's not getting out as quickly as many organizations say it is needed in the capital and beyond. In Port-au-Prince today, about 100 residents showed up for Mass at the remains of the city's cathedral. January 17, 2010  Most of Port-au-Prince's residents have been displaced from their homes and are in need of help. In the Morne Lazare neighborhood, a lone house stands precariously. Malia Yvette, a middle-aged woman, has survived with little more than an empty grain sack. She's sleeping in a park. And nearly all her family is dead. January 15, 2010  Elite rescue teams from France, Spain and the United States have plucked seven people out of the flattened Hotel Montana, once one of the nicest hotels in Port-au-Prince. The quake destroyed the luxury compound. But as time passes, hope for rescuing other survivors fades.